Seattle Seahawks safety Kam Chancellor is “likely done for the season” due to a neck injury, per Mike Garafolo of NFL Network. His loss represents another blow to the ‘Legion of Boom’, having lost cornerback Richard Sherman for the year last week. 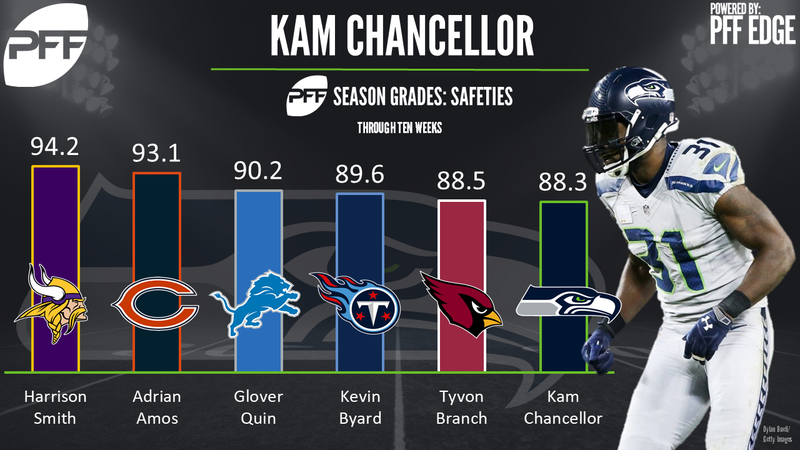 The Seahawks are the only team to boast two top-10 graded safeties in 2017, with Kam Chancellor and Earl Thomas ranking sixth and seventh at their position with grades of 88.3 and 87.6 through 10 weeks. Chancellor has particularly excelled against the run this year; his run defense grade of 88.8 ranks third among safeties. Chancellor has had an excellent career in Seattle since being selected in the fifth round of the 2010 NFL draft, never receiving a grade of less than 71.5 (which he posted as a rookie). His top-graded season came just last year, which saw him rank third among safeties with a season grade of 91.2. Chancellor’s absence will likely mean increased roles for former undrafted free agent Bradley McDougald and rookie third-round pick Delano Hill. McDougald has been solid the past couple of weeks playing in place of Earl Thomas (who is expected to return in week 11), posting game grades of 81.8 and 80.2 against the Redskins and Cardinals. Hill has only played 16 snaps so far this season, but spent 2016 as a starting safety for the Michigan Wolverines, achieving a grade of 83.9 which ranked 10th in the nation.